Rental equipment tracking and management is simple and efficient with QR Inventory mobile application / cloud software combination. Check out equipment out and record returns on site by scanning QR code / barcode label with a smartphone. Create custom mobile forms to record additional data for each transaction, and employees will be able to fill them out on their smartphones. Keep track of equipment maintenance, service and repairs in the field, fill out maintenance forms on site on the mobile devices. Access equipment location, status, due dates, usage statistics, transactions history, maintenance and service history in real time via a web dashboard. Track rental equipment and assets in the field and in the office in real time. Use mobile devices (smartphones or tablets) for QR code / barcode scanning, filling out mobile forms and information look up. Record equipment check out, returns, sending equipment to repair, receiving new equipment, and anything else that you need. You can create custom transaction types via a web based admin interface, and create mobile form(s) that need to be filled out for equipment transactions. 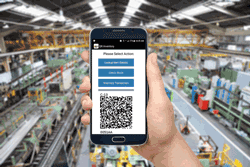 Use smartphones for barcode scanning and data collection in the field, save money on purchasing asset tracking hardware (barcode scanners, PDAs, mobile computers). Create custom mobile forms via the web admin dashboard, and your employees will be able to access and fill them out on their smartphones during equipment check out, return, maintenance, or when sending an equipment to repair. Recorded information is send to a secure cloud and is instantly available via an admin dashboard. Employees can use smartphones to take image(s) and attach to the equipment transaction for visual documentation (e.g. document equipment conditions on check out and return). Collect electronic signatures on a smartphone for equipment transactions, and create PDF receipt based on your template. View, print and e-mail receipt in the field from a smartphone. Keep track of equipment maintenance, service and repairs: maintain accurate service records and get automatic alerts when next preventive maintenance is due. Your employees can record equipment service and maintenance in the field by scanning QR code / barcode on the equipment and filling out a mobile form. All records are sent to and are stored in a centralized cloud location, and can be accessed any time from anywhere. Forms and records are searchable by multiple parameters, so you can find required information fast. Anything that your technicians need to know about rental equipment is accessible with one scan of QR code / barcode. Equipment specifications, instructions, pdf documents, maintenance and repair history - all data that your field employee need for productive work and smarter decisions. Process assets and equipment returned from multiple locations / clients in one inventory transaction. Scan all returned equipment with a smartphone, and QR Inventory will automatically determine where an equipment came from and include this information in the transaction. Save time and reduce errors by combining multiple transaction into one and eliminating manual location selection for each asset. Use NFC tags to process high volume return transactions fast. Using NFC technology, you just need to touch each asset with a smartphone to instantly add it to the transaction. No need to focus camera or go through several screens and clicks to add each item. One touch - and item is added, your smartphone is ready for the next item. If you prefer, you can also use regular barcode scanner connected to an android or iOS smartphone, android tablet or iPad. If necessary, transfer rental equipment directly from one client / location to another bypassing central warehouse. Track each asset / equipment individually by its serial number / unique ID, or track by asset type (e.g. video camera versus ten individual video cameras with unique serial numbers). Regardless of how you decide to track assets, you can always access total quantity of specific asset type in each location (e.g. 5 video cameras in house, 1 is rented out to client A and 4 are rented out to client B). If you have multiple assets that are different only by their serial number, you do not need to enter each asset into the system individually. Fill out all information once, then scan in each asset, or paste a list of serial numbers in the form, and you are done - all assets are entered into the system. Document asset conditions when it goes out for rent and when it is returned. Fill out custom mobile form(s), and optionally take photo(s) with QR Inventory mobile application. Track equipment maintenance and repairs, review service history and statistics. Access real time rental equipment status: location, clients, when equipment is due to be returned, available equipment, equipment in repair, etc. Access historic data (equipment transactions history, information filled out during each transaction), as well as equipment usage statistics.